In a perfect world, everyone would retain their bright white smile for a lifetime. In the real world, that is not always possible. Accidents and falls can result in tooth loss. Medications can soften your teeth and cause damage to the delicate enamel. A lifetime of sugary snacks can leave your teeth decayed and lead to gum disease. A love of coffee and tea can leave your teeth stained and discolored. If you are experiencing problems with your teeth, you may be wondering what to do. In particular, you may be wondering if dentures are the best choice. It’s best to discuss your options with your dentist who can refer you to a qualified denturist if you are showing signs that dentures are right for you. If you have lost one or more of your natural teeth, a partial denture could help you regain your bright white smile. Whether the tooth loss is the result of an unfortunate incident while playing your favorite sport, a fall or something else, filling that gap in your teeth is important. For the loss of a single tooth or a pair of adjacent teeth, your denturist can fit you with a simple partial denture. 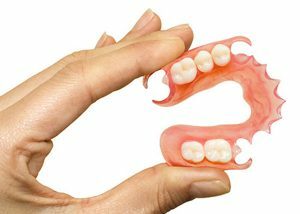 These partial dentures are unobtrusive, with a natural look and comfortable feel. Few things are as bad as the pain of a toothache. If you suffer from frequent toothaches, you know how debilitating they can be. If you are tired of this constant pain in your mouth, you might want to talk to your dentist and explore your options. In some cases, your dentist may be able to resolve the toothaches and save your natural teeth. In other cases, the damage may be too severe, and the best way to relieve the pain will be with a quality set of well-fitting dentures. It’s best to talk to your dentist and have them refer you to a Denturist if the damage is too severe. Loose teeth can be a sign of gum disease, and you should never ignore this problem. If the issue is caught early, your dentist may be able to save your natural teeth, but in some cases a set of dentures will be the best solution. Your dentist can determine the root cause of your loose teeth and let you know if dentures are recommended. If dentures are the answer, your denturist can help you with proper fitting and give you important care tips. Gum disease is a serious problem, one that can extend far beyond your teeth. When left untreated, gum disease can compromise the health of your entire body, making you more susceptible to heart problems and other dangerous medical conditions. If your gum disease is relatively mild, your dentist may be able to treat it without extracting any teeth at all. But as gum disease gets progressively worse, the treatment needed becomes more and more invasive. If you have an advanced case of gum disease, your dentist may need to do multiple extractions to arrest the spread and save the rest of your teeth. In that case, you may be fitted with a set of partial dentures to fill in the gap and give you a more natural smile. Your dentist will work hard to save your natural teeth, however, there are times where dentures are the best solution to your problem. From gaps in your smile to damaged teeth, a qualified denturist will be able to help you restore your smile and allow you to enjoy your meals again. If any of the above situations apply to you, talk to your dentist or have them refer you to a denturist to discuss your denture options. Every case is different and there are many other reasons why dentures may be right for you. We provide consultations to new patients who are considering dentures. Give us a call or reach out via our contact form to book your appointment. Alternatively, we accept walk-in patients as well and our office is conveniently located on Shelbourne St in Victoria.